Wait a cotton-pickin' minute! Before we call it off, let me tell you about these egg custards. There are Chinese and Japanese versions of this dish ('chawanmushi' means 'teacup steamed' in Japanese), and it's one of those things that you'd think are a bit of a wishy-washy, not-quite-a-dinner type dish until you try it on a cold night and it warms you right up. I had a beautifully smooth chawanmushi at Shoya restaurant in Melbourne, but have never thought to make it myself. Then I spied the Poh's Kitchen version and was converted. This recipe is from MasterChef runner-up Poh's new cookbook (the same recipe and photos are also in November delicious magazine). Poh also writes that century or salted duck eggs can be added to the custard, and guess what? I had a duck egg on hand (what are the chances?!) so in it went. It gave a real boost to the dish, so if you can find a suitable duck egg, please bung it in. 1. Half-fill a wok or saucepan with water. Top with a bamboo or metal steamer that will hold 4 small bowls or 1-cup ramekins. Bring the water to the boil then reduce to a simmer. 2. Meanwhile, combine prawns, shaohsing, sugar. pepper and soy sauce and set aside to marinate for 10 minutes. 3. In a bowl, briefly mix the eggs, chicken stock and a pinch each of salt and pepper. Hint: Use a pair of chopsticks to do slow figures of eight to mix; don't whisk heavily or bubbles will form. 4. Divide prawns and marinade, shiitake, century duck egg (if using) and egg/stock mixture into the bowls and steam with the lid on for 7-10 minutes. When done, the custards should be opaque and creamy in colour and still a bit wobbly. 5. Remove bowls from the steamer and sprinkle with spring onion and some light soy sauce. Serve while hot. 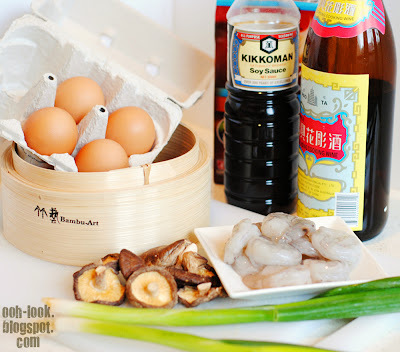 Ingredients, including eggs, prawns, shiitake mushrooms, spring onion, chicken stock, soy sauce and shaohsing wine. I also added a century duck egg that I picked up on our tour of Cabramatta. Look at the coffee-brown egg albumen. The yolk was a granite grey colour that would be scary if you didn't know what to expect! The regular hen eggs are lightly whisked with chicken stock. The egg custards can be prepared using ramekins or teacups. It's a more substantial dish if you use 1-cup capacity bowls or ramekins, though. ﻿Closeup view of the silky egg custard. The marinating of the prawns beforehand imparts a beautiful flavour to the meat and also the egg custard. Century duck egg is one of my favourite comfort foods... must be coz it reminds me of mum and being cozyied up at home! .. Silky egg custard.. oh man I really want some.. now!! Mister makes a mean egg custard. Mustn't forget to add century duck egg next time. oh yum, this looks like it would be really tasty. I dont know how I would go making it myself though, I'd probably stuff it up!! 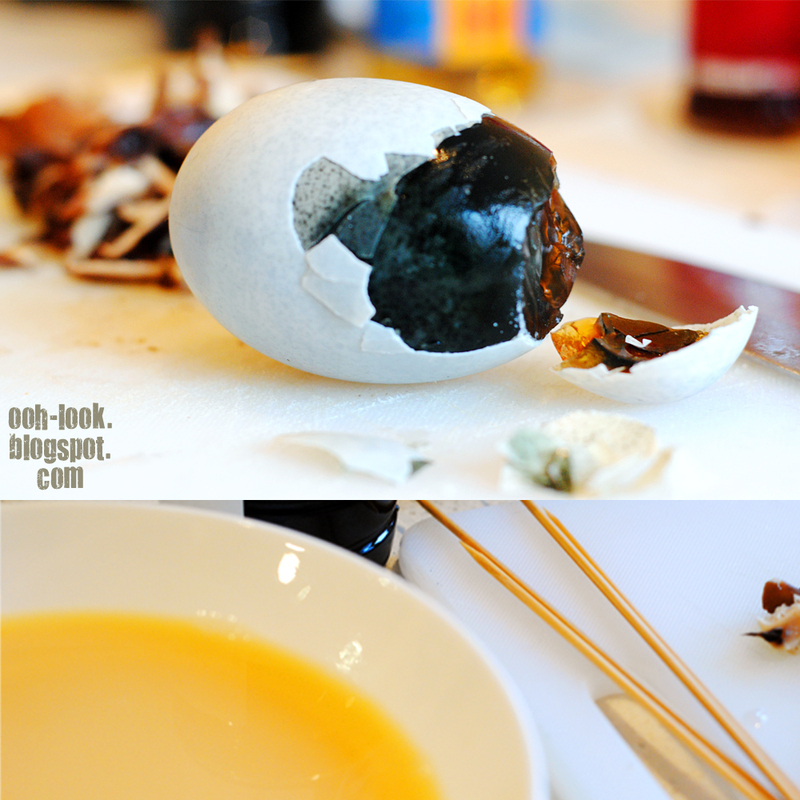 That century duck egg looks a little scary, but I'd be willing to give it a go! Great photos as always Belle. i lovelovelove chawanmushi. 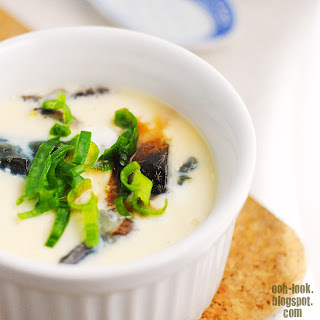 such a decadent idea to include century egg within the custard too. yum! I've only ever had a sweet custard before but it seems like it would lend itself to savory applications really well! This sounds glorious! Work computer doesn't like your verification! Now I have to remember what I wrote... oh yeah! It certainly looks and sounds so utterly smooth and silky! Don't know if I'm game enough to try century egg though. The ones Mum made at home were always a combination of salted duck egg, century egg and whisked chicken's eggs. Sometimes some dried shrimp thrown in for saltiness. Wonderfully silken and absolute comfort eaten with rice. I don't think I'll ever stop being mesmerised by century eggs. Can't say I've enjoyed the one experience I had trying it, but this looks so nice I'd be willing to have another crack at it. That's one gorgeous dish Bel! I have a couple of century eggs that have been in my fridge for ages (!!) - now I can use them for this. 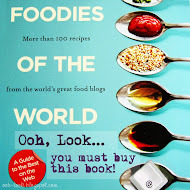 i've had my eye on this recipe when I saw it in delicious magazine and well, been quite eager to buy poh's cookbook now that it's hit the shelves! Lovely combination with the added century egg, thanks for reminding me that it's so easy to make - next on the to cook list! I spotted the same recipe from delicious magazine but didn't get around to make it. Steamed egg custard with centry egg is my fav combinations. Love the styling of your dish. Love this idea. When i saw egg custard, i automatically thought of a sweet version but am so pleased to see it is not. Looks so gorgeous an dfull of lots of flavour!!!! 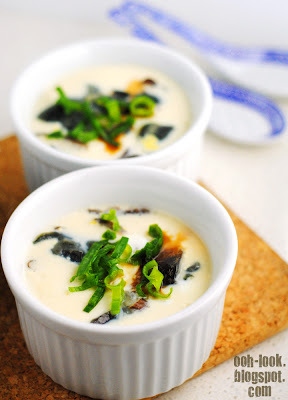 Chawanmushi is one of my favourites! 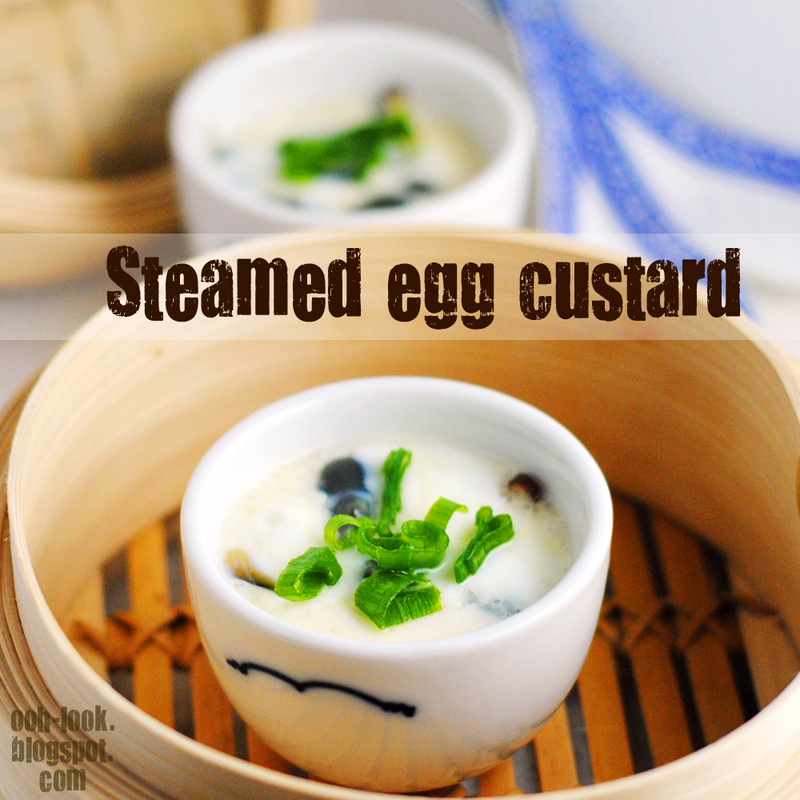 I loved steamed egg custard! I've only had the chinese version though- this looks really really yummy =) I love the idea of putting the duck eggs in too! Thank you so much for this. Made it tonight and turned out great. I've been looking for a good recipe for years. The duck egg adds a nice touch. I love chawanmushi/egg custard! Good idea about using a duck egg, I can imagine it would impart some richness. Yum!